Central to who I am as a teacher is the notion that I have clear, consistent, and fair expectations . The teacher I admire most at my school showed me that it can work, if done right. I’m sure at some point I’ll write about that when I craft my current philosophy of teaching. Which is, well, not now. Now, I want to share with you something my department head does with her classes, and this year I’ve stolen it for my Algebra II and Calculus classes. I will admit that at first, I was against doing this. I think it is the students’ responsibility to learn how to study in my class. To learn how to organize the information we’ve learned and create his or her own study plan. And my first thought: HANDHOLDING! CODDLING! PSHAW! But you know what? I teach the non-accelerated classes. My kids don’t know yet how to organize all that we’ve learned. And things are much harder because I don’t teach out of the textbook. I use the book as a supplement, and (at least in Algebra II) I jump around in it a lot. A LOT. A LOT A LOT A LOT. And I use a lot of my own worksheets, and only assign textbook homework about half the time. So the course is necessarily confusing because the information isn’t all in one place. For that reason, I feel comfortable giving them these topic lists. Hey, I know, I know. It’s nothing like the “skills based assessment” that Dan Meyer and his offspring have adopted. But having a list of skills for my students to look at when preparing for my regular assessments is helpful for them. Heck, it’s going to be super useful for me because next year to see exactly what I taught this year, in some sort of codified and consistent form. The expectations have to also be reasonable and I have to provide the resources to achieve them. I don’t know if I would give topic lists to my kids if I were teaching the accelerated tracks. I feel if you’re in an accelerated track, I expect you to know how to study. Also, topic lists would probably be less useful because the problems I’d probably include on exams would be ones that force students to think a little outside of the box, and to synthesize information in a slightly different way than they’ve seen before. The topic lists couldn’t account for those kinds of questions, without giving them away. I am certainly one of those knee-jerk “HANDHOLDING! CODDLING! PSHAW!” people–but I don’t think I would be as much if I didn’t see said hand-holding happening around me to various extents. I feel like I need to balance it out. Especially for my seniors, who will get very little hand-holding in college. I know this makes me a grump and a big meanie, but one of my concerns with topic lists like this is that it gives the lazy students help they haven’t earned. If you’ve been in class, and actively participated, taken okay notes, found out what was covered when you were absent, and stayed on top of the homework, then you’ll have a good idea of what will be expected from you on the assessment. Also, your “topic lists” look more like “question-type lists” to me. I do give out “topic lists” from time to time, but they do not contain question types, just concepts. Why do you care what college courses are like? I want my students end the year with an improved attitude towards math, more confidence in their capabilities and demonstrated mastery of the core concepts of my subject. While I don’t think guides like this are coddling in the least, I’m willing to coddle! 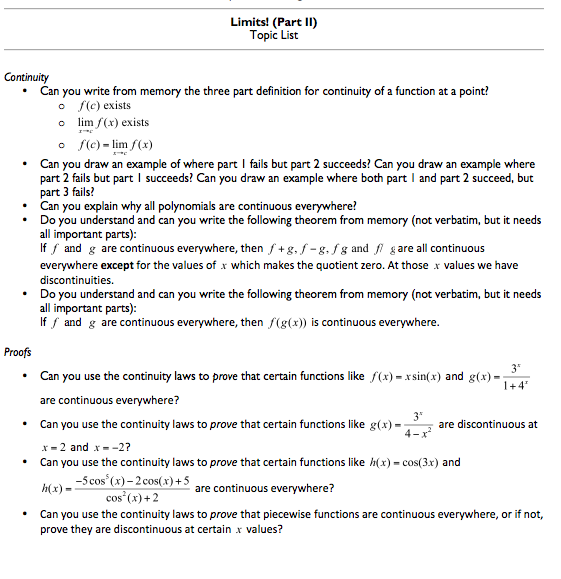 If my calc student ends the year broken, frustrated and pissed off at the whole of mathematics, wether she knew that memorizing the continuity definitions would be an important study skill is completely irrelevant. I want my students to take more math! They’ll only do that if they’ve achieved real success and feel inspired and excited about learning more. College math classes engage in many practices that I consider unsound for high school students — from class-size, schedule, lecture length, homework policies and on down the line. I’ll support my students in any way that brings them to legitimate, assessed mastery of the material. Skill-based assessment makes sense to me for this reason, although I wasn’t aware that using it was enough to ensnare you in Dy/Dan’s brood. I want my students to take more math, too–which is part of why I care what college courses are like. (Another part is that I teach at a “prep school”, and as such I feel as though part of my responsibility is to “prep” them for college.) I don’t want them to run into a wall when they take, say, Linear Algebra or Multivariable Calc, suddenly no longer having all the supports in place that they had had in my class the year before. I’m sympathetic to the preparatory idea, but it’s used so often to justify things that aren’t age appropriate. I constantly struggle between a what I tell myself is “realism” about how my classes need to look like, and feeling that I’m giving out “being hit on the head lessons.” Just because the unpleasant and unfortunate thing will happen to them in the future isn’t a justification for doing it to them now. I should acknowledge that I’m sensitive to this “prep” issue because I’ve primarily taught in k-8 and k-12 schools. I’ve seen too many restrictions that seniors and juniors need to “prep” them for college pushed down younger and younger so that 7th graders are “ready” for how high school works. Hence, I’m always fired up to go draw a line in the sand and stay firmly on “provide maximum support” side. I like this idea Sam. For the majority of students, I would not consider this handholding at all. I think it is important for students to know what they will be held accountable for. Eventually, when these kids leave you, they will learn to make lists like this on their own when studying for exams. You’ve provided an excellent framework that they will be able to use all the way through college. So many students have no idea how to study for a math test. In fact, I hear all the time that it is “impossible” to study for a math test. Students believe they either know the material or they don’t and studying will not help them. 1. Even though I have a responsibility to teach more than just math, and I would never say that I teach only math in a classroom, I feel like my first and foremost responsibility does revolve around math. And these lists do help them. Organize their thoughts, their study time, and they allow me to put some “concept things” for them to think about before the assessment. 2. These lists, I know, are a crutch for teaching my kids independence in their learning. They aren’t learning the skills of how to prepare independently for an assessment. 3. But I could teach them that. I didn’t make that a formal part of my curriculum this year. This year was about organization of homework and assessments with the whole binder check thing. In future years, I could start out by making them topic lists. Then as the year goes on, ask them after going over homework, to write down the “topics” that they would put on a topic list of their own if they were going to create one for the next assessment. 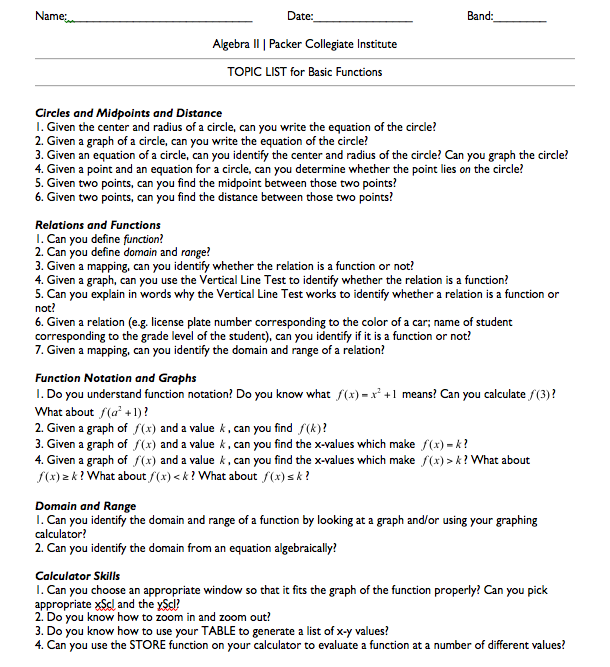 (We could talk about mathematical writing and terminology, so their topics are written clearly… something that I anticipate would be hard for them…) Then on a particular unit, I would say that part of their homework each night would be to “start and keep an ongoing topic list for the unit.” I would then collect and assess their topic lists. Or something like that. Where it becomes a skill I teach them — to organize the information as we learn it. 4. But since I am not explicitly *teaching* the skill, and most of my kids don’t already possess the skills, I decided that I would give them this crutch. Which is why I decided I was okay doing it. It’s my first year doing it, and maybe I’ll change my mind in the future. But just so you know why I made the decision I did.